No, you’re not hearing double. That voice you hear on Swearin’s new single, “Dust in the Gold Sack,” is not that of Katie Crutchfield, the young artist who released a very well received solo album under the name Waxahatchee for Don Giovanni Records this past spring. Rather, it’s her twin sister, Alison. Alison is Swearin’. Katie is not. And, oh boy, is Alison’s Swearin’ about to take off. Not only is her voice full, fluttery, and emotive on “Dust in the Gold Sack,” but her band backs her up with well timed punches of guitar squawk. If indie rock still moved units like it did back in the go-go ’90s, this single would be the first signal that Swearin’ were in line for a nice pay day. Catchy doesn’t even begin to describe this one. We’re talking buzz bins, rom-coms, and hygiene product commercials. Swearin’ could have had it all. For now, they’ll have to be content with clicks, lots of clicks. 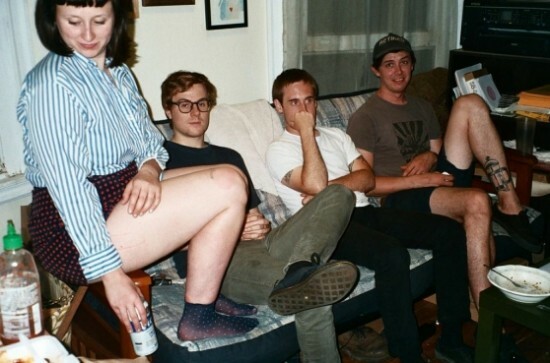 Swearin’s latest, Surfing Strange, will be released 11.5 on Salinas Records.